Is it possible that the immensity of God’s love could fit into a human heart? Although the very idea sounds absurd, we recognize that it is not only possible but a central truth of our faith. When the Word became flesh, the infinite God whose very being is love enabled this miracle of miracles to become reality. A human heart that beats just like yours and mine became the vessel of His infinite mercy and compassion in time and space. As with any time we refer to the heart in the spiritual life, we are including both the physical and the spiritual realities. How could we ever separate them? If, for example, I am to love God with my whole heart, I am to love Him from the depths, from the core of my being. My “heart” seems to represent my very soul. On the other hand, the physical organ responsible for pumping blood to all the living tissues of my body is very much involved in the action of complete and perfect love. Indeed, I am proclaiming that I am willing to die for my Beloved when I love with my whole heart. I am giving, I am offering, that which keeps me alive. The One who has my heart has my life. There is no greater love. The reality, however, is that I am not the one who has made such an offering; it is God Himself who gives His heart. Through the flesh and blood of Christ our Savior, the One who created all things demonstrated His willingness to die out of love for His children. We, the beloved children, have come to know this total giving of His heart as an event in human history. The Lord of Glory voluntarily gave Himself up to the lowest of deaths – abandonment, ridicule, crucifixion. But unlike all other human gifts of the heart, this gift is eternal. In Resurrection, death has no more power to destroy it. In Eucharist, we consume and are consumed by a holy Love beyond comprehension. Only a Heart this sacred could love us so profoundly as to transform us, to enable our hearts to beat with the very same Love as His. No image can portray Him. No artist’s rendering can express the divine Love that filled His human heart and now overflows into eternity. But I share with you one unique portrayal I came across as I contemplated this solemn feast: “Sacred Heart”, by French painter Odilon Redon. 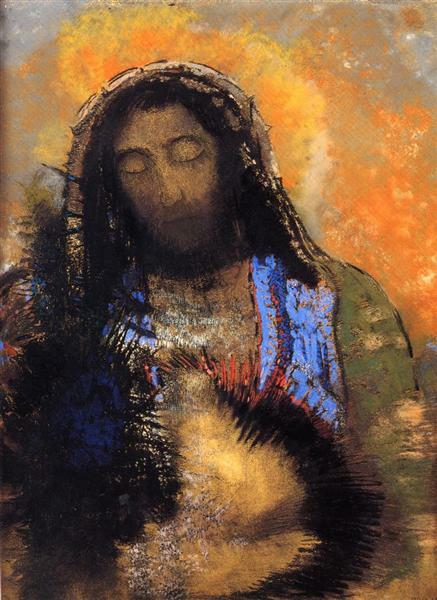 Perhaps no one will ever know what moved Redon to create this image of our Savior. And yet with us it remains, ever to awaken in us a vision of His glorious Love. This entry was posted in Uncategorized on June 24, 2017 by mary. It meant a lot. I need to make a booklet for easy revisiting! Thanks, Al. Yes, I believe it is OK to pass on the image by Odilon Redon, though I would cite him as the artist. My investigations suggest that the image is considered to be in the public domain. It’s a keeper.